Home Good Deals Keurig K-cup Coffee Giveaway! It is time again for another Keurig K-cup coffee giveaway! Every month, Cross Country Cafe will host a giveaway for four full size boxes of Keurig K-cup coffee. With the dog days of summer upon us, one lucky winner will receive four refreshing boxes of Brew Over Ice Keurig K-cups for the month of July! 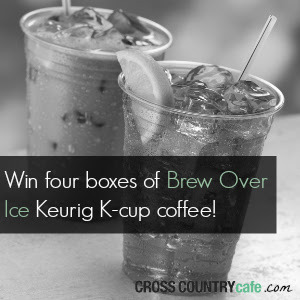 Win four free full size boxes of Brew Over Ice Keurig K-cup coffee! Entrants will be accepted until July 31st, 2014 at midnight EDT. One random winner will be chosen on August 4th, 2014 and notified within 48 hours.